Very Cool and Trendy Design! Our Elenora Royal Blue Fox Fur Jacket is a vibrant accent for her to pair with a black ensemble. 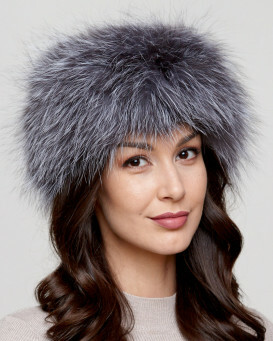 The stunning look is designed with silky dyed Fox Fur in a patched piece style. 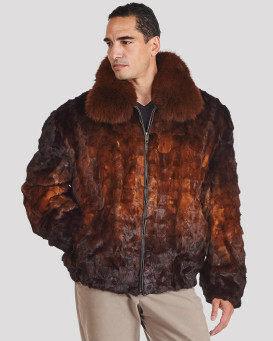 A large Fox Fur collar accents the design for a winter look. Side pockets help keep your hands warm and your valuables safe. This gorgeous jacket features three hidden hook and eye closures to affix over your shirt or adjust to your liking. A silky soft lining enhances the shelf life of this designer piece. The dimensional look is excellent for running your errands in style. "The color is gorgeous & vibrant . Perfect fit that is true to size Fast shipment. Absolutely a fan if FurHat World"
"Love this coat and I always get complimented on it. The colour is beautiful. The fit is slightly more boxy than expected, based on the pictures, but I prefer it that way. Only thing I don't like is that the fur origin is China, rather than Europe (particularly Scandinavia) where they have strict ethical standards to adhere to." "Delighted with this jacket. Size is spot on. Color is beautiful and it’s warm and snug. Can’t wait for colder weather to get showing it off."